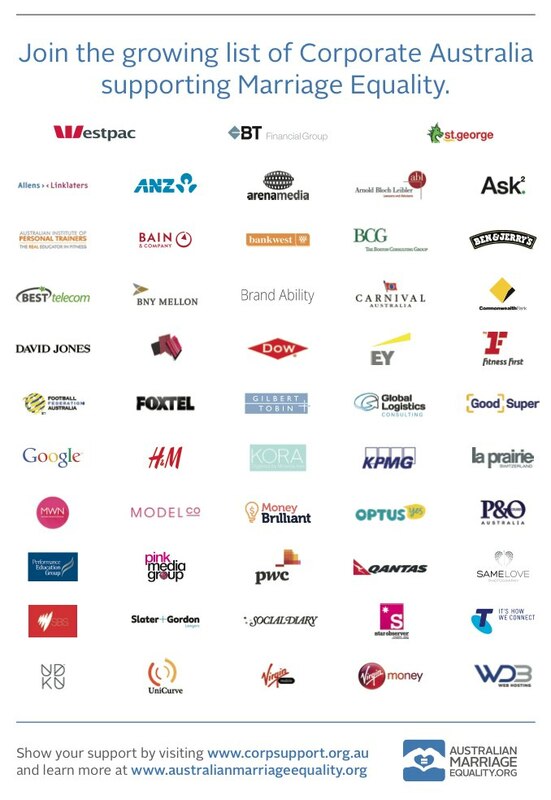 Taking out a full-page in today’sThe Australian, some of the country’s biggest businesses have declared that “corporate Australia supports marriage equality”. Supportive brands include Westpac, BT Financial, St George, ANZ, Commonwealth Bank, David Jones, Fitness First, Foxtel, Google, KPMG, Optus, PWC, Qantas, Slater & Gordon, Telstra and Virgin Money. These supporters, along with many more, have signed a letter of support calling for marriage equality to be legislated by Australian parliament. 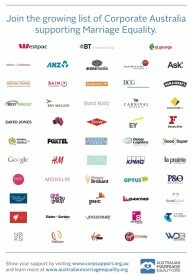 Australian Marriage Equality encourages all Australian businesses to declare their support by visiting www.corpsupport.org.au. Rodney Croome, national convener of Australian Marriage Equality, said,“I applaud Australia’s business community for its leadership on marriage equality, and for the powerful message it is sending to our federal representatives about moving forward quickly on the reform.